Leave it to Alexa Chung to make a style statement in this effortlessly chic summer look. Luckily for the rest of us, this classic and simple outfit is really easy to replicate. It starts with a black and white striped tee, a timeless wardrobe staple most of us likely already have in our closets. This gets paired with a pair of dark wash skinny jeans cuffed at the ankle. The look is finished off with black lace up espadrilles, a floppy straw hat and a chain detail shoulder bag. Would you wear this outfit? Are you a fan of Alexa Chung's style? Join the fight against frizzy hair and enter my VO5 haircare giveaway! I love Alexa Chung's style too! Her and Leandra Medine are my faves. I'm a huge fan of how Alexa Chung is able to make comfortable look so chic! 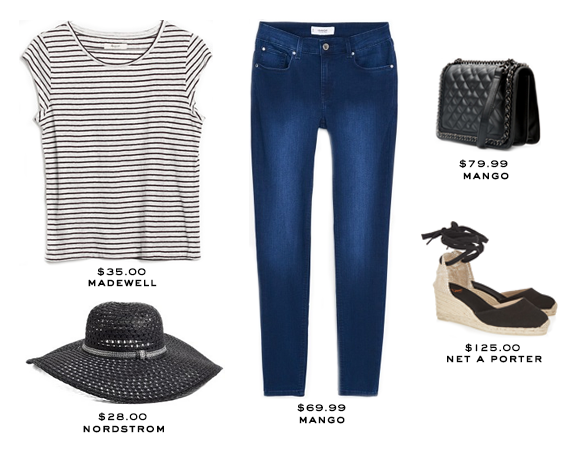 The striped tee is a defo staple in any wardrobe and the hat just elevates the summer look! I love it! I love her style! Would really need a tee like hers. It's timeless. Cool look, I love her style!!! Very cool fashion I get it why you have a style crush. minus the shoes and hat, i'm wearing this today! i'm feeling stylish! I have seen her appearing in a few online articles and have always thought she looks a little snotty but I guess that's how anyone would look if paparazzi are in their face. And then she appeared in one of Lisa Eldridge's videos and she was so funny and down to earth! Totally changed my mind about her and yes, her style is always so spot on. She's one of the most loved girl! I so love how effortless this look is. There's nothing like an amazing casual outfit that looks like a million bucks. Beautiful choice Rowena. Alexa has always been good with fashion, something I am very jealous of! She has a very easy and lovable style. Love her tomboyish style too because it reminds me of school days! That's a really cute outfit! She is so stylish. I love her style. Absolutely loving this outfit. The whole look is perfect. I love her style! This outfit is so perfect! She just always gets it right, doesn't she? Oh yes she IS a style icon, I actually brought pictures of her with me last time I went to get a hair cut. This styling has your name written all over it, Rowena! That's so you! Couldn't agree with you more on this timeless, elegant pieces. She has a great sense of style, Rowena. 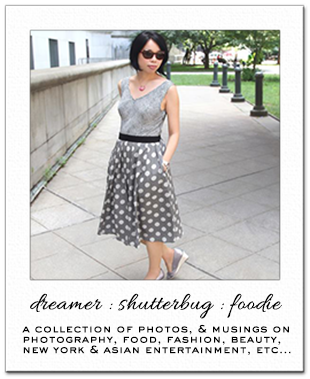 Love that effortless chic outfit you recreated here. I'd totally wear this look and I love that hat:) Happy weekend, love. Love her look! Stripey tee is so classic. Oh yes! I love this outfit, it's so simple but stylish! Oh, Rowena, to be honest, I don't have a stripe tee in my wardrobe, but it's an item I've been wanting for so long! I am stealing the idea for this outfit! I am not really familiar with her style, but she looks cute!